If you love cooking with spices then you will love making this. 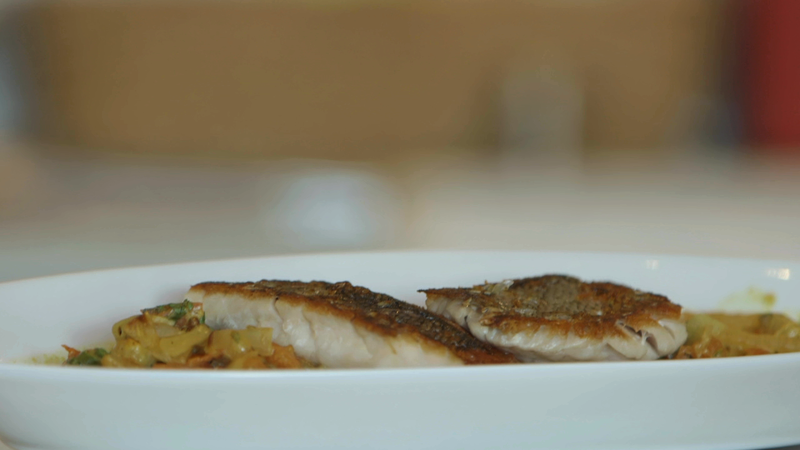 Dan takes a classic Indian curry and pairs it with an absolutely amazing fish plucked right from the lakes of Canada. It may seem like a bit of work to create this dish, but the hardest part is making sure to gets your spices right. • Mix together in a bowl. Reserve. • Brown onion in hot pan with canola oil or ghee. Once really brown add ginger, garlic and all the garam masala. Fry for 2 minutes. • Add tomato and degalze with coconut milk. Simmer for 10 minutes. • Finish with lime juice, cilantro, sugar and salt to taste. • Pan fry pickerel skin side down in olive oil on high heat. Season with salt. • Pour curry in a shallow bowl. Place pickerel on top skins side up.